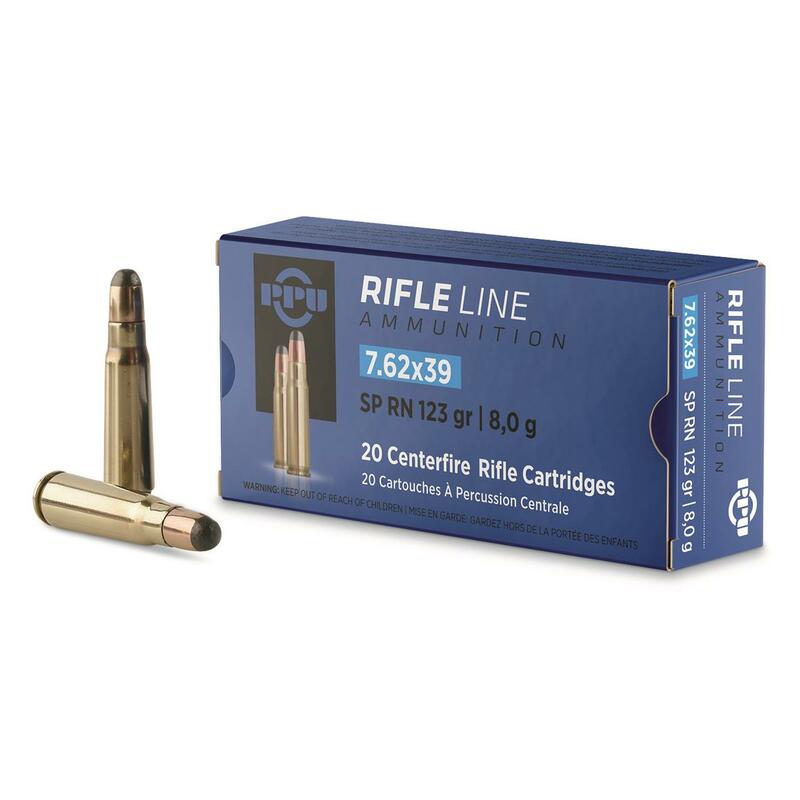 Made using topnotch materials and manufactured to exacting standards and tight tolerances, this is HOT ammo for hunting and plinking, made affordable! From Prvi Partizan, the top Serbian munitions manufacturer. PPU, 7.62x39mm, SP, 123 Grain, 20 Rounds is rated 4.5 out of 5 by 66. Rated 5 out of 5 by Texansteve from Great round I use these in my Windham AR15 for deer and hogs out to 100 yds. Very accurate and deadly. Rated 5 out of 5 by Mike5555 from My Go-To Deer Ammo Accurate, Inexpensive, Effective. Took this 178-pound 8 pointer at 45 yards. He ran about 70 yards and piled up within sight of the deer blind. Rated 5 out of 5 by Henry from Great Ammo. Very good ammo would buy again. Rated 5 out of 5 by Fred from Very accurate round Bought these to use as my deer hunting bullet for my Howa mini action bolt action. 100 yards 2 holes touching and one 1/2" high due to me pulling the shot. Haven't shot any through my semi auto's, but in the bolt gun it has very good promise. Will definitely be buying more! Rated 5 out of 5 by andinconclusion from Great Value for the Money Unusual looking round, even for a soft point, takes on the look of the old dum-dum bullets. Fired 50 rounds through SKS Carbine. No misfires, no mis feeds, and hitting within a 2 inch circle at 75 yds. By the shape of the bullet I would also imagine that these rounds have the punch of receiving a brick at over 2,000+ ft/sec. Very impressed. I'll buy more. Hog hunting is the game. Rated 5 out of 5 by Steven from Good deal! Best price for brass ammo for the mini 30. Worked flawlessly. Very happy with the ammo. Rated 5 out of 5 by ZooT_aLLures from Best thing to happen to the 7.62x39 These cartridges work "great" in my early Rossi singleshot 7.62x39.Can hold 2" groups at 100 yards without much effort.Were the trigger on the Rossi better, I know I could shrink that group to 1". Hunt ammo that works as hard as you do.